5 ¾" HEADLAMP 154mm diameter satin black powder-coated bowl with light textured finish. 138mm diameter lens. Main beam, dipped beam and sidelight. Bulbs included. Front to back dimension 1124mm. 1/2" UNF plated mounting bolt, washer and nut with spherical seat for easy angle adjustment. Overall height including mounting bolt 200mm. 20mm long flylead with male bullet terminals. Great value. Weight 935 gms. 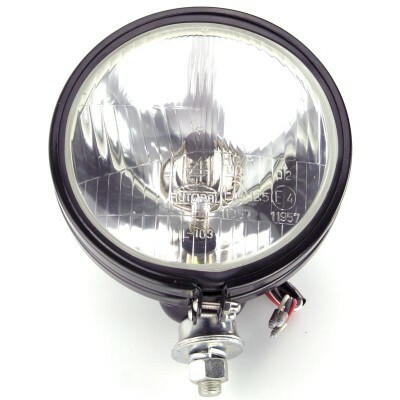 Your headlamps will have to be disassembled for connection and wiring of the sidelight. Remove the outer clamping ring and the lens assembly. On the rear of the lens you will see three, raised, location stand-offs. On reassembly these must be accurately located in their respective cut-outs in the rubber mounting ring. the two raised parts in the middle of the cut-outs. (see pictures).